While there has been measurable improvement in the condition of America's children since 2000 according to several key health and education indicators, four indicators of children's well-being (including the number of children living in poverty) have worsened, according to data released today. "The 2009 KIDS COUNT Data Book," compiled by the Baltimore-based Annie E. Casey Foundation, profiles the well-being of American children according to key health and socio-economic indicators, comparing data from between 2000 and 2006-2007 to measure progress and to rank indicators on a state-by-state basis. The new data shows that five key indicators of a child's well-being in the United States - infant mortality rate; child death rate; teen death rate; high school dropout rate; and rate of teens not in school and not working - have improved since 2000. But in four key areas - low-birthweight babies; children living in families whose parents lack full-time employment; children in poverty; and children in single parent families - conditions have worsened. In addition, the teen birth rate - though below what it was in 2000 - is rising, the first increase in a decade. The "KIDS COUNT Data Book" incorporates data from 2006 for health indicators, and 2007 for socio-economic and education indicators. Laura Beavers, coordinator of the national KIDS COUNT project, said the improvement in almost all health indicators is welcome news, but that overall improvement lags compared to what was seen in the 1990s. What is more, Beavers noted that the economic indicators reflect the conditions at the time of the most recent available data (2007), well before the worst effects of the recent economic downturn - such as the doubling of the unemployment rate - were experienced. She said the worsening of economic indicators in states like Michigan and Ohio shows these latest figures are "the canary in a coal mine" in determining the impacts of the economy on children. Beavers said that while the current data shows slightly more good news than bad for children, "there are some trends going in the wrong direction." Overall, Beavers said, "It's not on par with what we saw in the 1990s." For one, after more than a decade of steady decline, the teen birth rate is trending upward, with rates increasing in 41 states. While still below what it was in 2000 (48 births per 1,000 females ages 15-19), the national rate increased between 2005 and 2006, from 40 to 42 births. 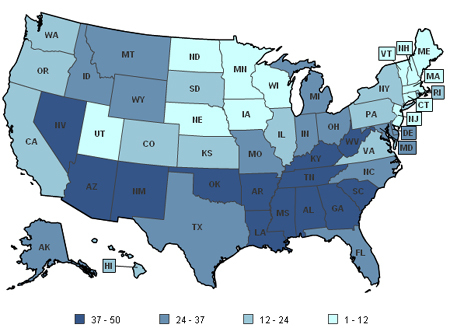 Among the states, the teen birth rate ranged from 19 in New Hampshire to 68 in Mississippi. This is especially troubling because, Beavers pointed out, babies born to teen parents are more likely to be born with low birthweight. Also, while the poverty rate for children remains between 17 and 19 percent during this decade, the 2007 rate of 18 percent means there were 900,000 more children living in poverty than there were in 2000. Beavers called that "a number that spurs our call for change." "The progress we've made falls far short of what is possible," said Senior Vice President Patrick McCarthy. He said it is critical for government policy makers to have the best data available in order to better inform decisions affecting families. To that end, he called on the federal government to make sure the 2010 census is adequately funded and well-managed, and to improve outdated measures of poverty. He also pointed out that regulatory differences and the use of incompatible technologies have made it difficult to integrate data collected at the state and local levels. The online Data Book, which McCarthy previewed, is a new Web-based database that allows users to check child data at the national, state, county and city level, as well as create customized maps, trends lines and charts. The President and CEO of the Casey Foundation, Douglas W. Nelson, said that what is demanded by the current technology environment is a more effective collection of data at federal, state and lower levels. "Systems and organizations charged with helping disadvantaged families and communities succeed must capitalize on new opportunities afforded by today's information revolution to bolster their efforts to measure and improve outcomes," he wrote in the report released today. The infant mortality rate slightly improved in 2006, at 6.7 deaths per 1,000 live births. The child death rate fell in 2006, to 19 deaths per 100,000 children ages 1 to 14, from 22 deaths per 100,000 in 2000. The death rate for youth ages 15 to 19 dropped from 67 deaths per 100,000 teenagers in 2000, to 64 deaths per 100,000 in 2006. The high school dropout rate fell. In 2007, 7 percent of teenagers age 16-19 were not in school and had no high school diploma, compared to 11 percent in 2000. The percentage of teens (ages 16-19) not attending school and not working dropped slightly, from 9 percent (2000) to 8 percent (2007). The percentage of low-birthweight babies (less than 5.5 lbs) increased from 7.6 percent to 8.3 percent - a rise of nine percent - between 2000 and 2006, to the highest level seen in four decades. Nationally, the teen birth rate is below what it was in 2000, but it rose between 2005 and 2006, increasing from 40 to 42 births per 1,000 females ages 15-19. Forty-one states saw an increase in the teen birth rate in 2006, while only six states and the District of Columbia experienced a decrease. In 2007 there were 24,281,000 children living in families whose parents lacked full-time, year-round employment, or 33 percent. This represents an increase from 32 percent in 2000. The percentage of children living in poverty (income below $21,027 for a family of two adults and two children) increased, from 17 in 2000 to 18 percent in 2007. There are 900,000 more children living in poverty in the U.S. than in 2000. There was a small increase in the percentage of children living in single-parent families, from 31 percent in 2000 to 32 percent in 2007. The "KIDS COUNT Data Book" uses the most up-to-date data available from Federal agencies. 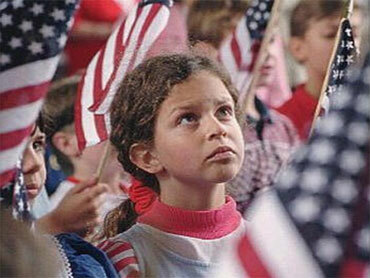 2007 economic and education data come from the U.S. Census Bureau's American Community Survey. 2006 data on births and deaths come from the National Center for Health Statistics.